When the Doctor arrives, Nyssa and the other inhabitants of the school soon discover that the ghost is merely part of a darker, deeper and more deadly game involving rogue psi talents and something else… something not of this Earth. The Big Finish productions of Doctor Who aren’t just a homecoming for actors from the classic series, but a return for some of those who labored behind the scenes, writing and editing the scripts that found their way to television, for better or for worse. Andrew Cartmel worked as a script editor during the final seasons of the original BBC run under John Nathan-Turner, helping pen the Seventh Doctor’s final speech at the end of Survival when it appeared the show was going to be cancelled. In Whovian fan circles, the “Cartmel Masterplan” had an almost mythical status; a planned story arc that would see the mystery and myth returned to the character of the Doctor before the series’ untimely, but temporary, demise. With a few Who novels and comic strips under his belt, Cartmel was a natural choice to pen an original audio for Big Finish. The resulting serial, Winter for the Adept, is a solid, atmospheric piece for three episodes, before collapsing under its own weight and dragging itself along to an out-of-place and anti-climatic finish. 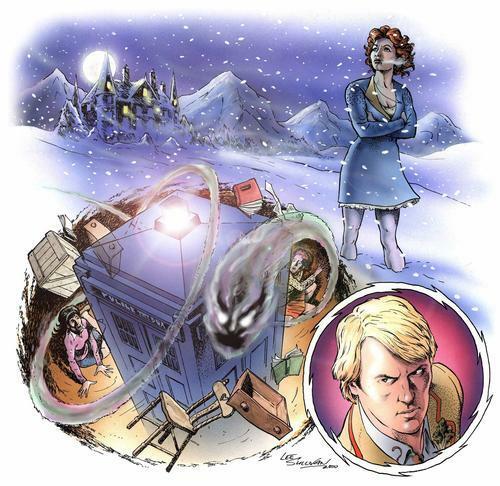 The Swiss Alps, December, 1963 and Nyssa is freezing her skirt off after a teleporter accident during one of the Doctor’s experiments has stranded her on the freezing slopes. In the nick of time, a local member of Search-and-Rescue rescues her on his way to visit a local finishing school high in the mountains. With everyone on Christmas holiday, only two mischevous students, the religious headmistress, and her French assistant remain. But there appears to be another resident of the school – a malevolent poltergeist bent on terrorizing the women. Once the Doctor arrives in the TARDIS (“An agent of Satan!” “Ah, not quite.”) the investigation begins. And it turns out, the truth behind the haunting goes beyond a simple ghost trapped in the walls. Let’s start with the companion. Sarah Sutton plays Nyssa as annoyed, worried, and skeptical of the Doctor’s experiments; as she should be, considering she was thrown into the mountains unprepared thanks to him! It’s a bit of a change from how Nyssa is normally portrayed, but the change comes off as natural, not forced simply because of the script. Even when she plays the standard companion role of “hand the Doctor stuff and ask questions to get exposition,” she still displays wit and a bit of distrust at what the end result will be of the Doctor’s latest test, doing so in a way that comes off as believable and a bit charming. Listeners might also notice that Nyssa’s problem with telepathy are mentioned again, this time with a little more weight then in The Land of the Dead. It’s a story point that pays off in the next Nyssa audio, Primeval. 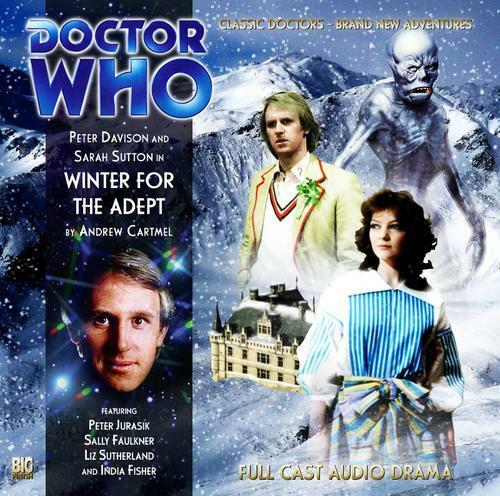 Peter Davison sounds like he’s having the time of his life in this play. Beginning from his arrival in the attic, the Doctor displays his natural curiosity, immediately throwing himself into the mystery of the strange haunting. He postulates theories, conducts experiments, draws conclusions…and when they’re all completely and utterly wrong, he charmingly shrugs it off and goes right to the next one. When he eventually reaches the truth behind the cause of the haunting, it’s at the end of a whirlwind daisy-chain of ideas, thoughts, and evidence that only the Doctor could cheerfully figure out AND explain in a way that makes perfect sense. And when tragedy strikes, Davison doesn’t stand for it and lets the person responsible know it in a manner that only the Fifth Doctor could. The supporting cast consists of some familiar faces…er, voices…including one Peter Juraski, aka Londo Mollari from Babylon 5 as Lt. Peter Sandoz, the law enforcement officer who takes responsibility for protecting the residents of the school in this time of crisis. It took a few times of louder dialogue and shouted to words to realize just who I was listening to, and Juraski does a great job as the skeptical Sandoz, who doesn’t believe in ghosts and just wants to evacuate the school without wasting time and energy on the Doctor’s experiments. India Fisher is also present, a voice actress who will be better known to Big Finish listeners as one Charley Pollard, companion to the Eighth Doctor, portraying student Peril Bellamy. She does a fine job in a secondary role, but isn’t given enough to really make her stand out. The same goes for Liz Sutherland as Allison Speers, whose diary entry bookends the serial. Both students are critical to the plot, but don’t have a chance to differientiate themselves, sometimes making it a little confusion as to which student is involved in a scene. I don’t want to give away Chris Webber’s part in the serial, although it comes as a very sudden surprise. Literally, just “boom, here he is.” You know who he is, though, and his accent immediately makes him stand out in a positive way. The same, in terms of accent, goes for Hannah Dickinson and her French way of speaking. Sally Faulkner, and her portrayal of the God-fearing, purity-obsessed, over-protective Headmistress Tremayne is the stand-out. Not overbearing, not unwelcome, she plays the role with just the right hint of piety, zealotry, and concern. Again, Big Finish nails the sound of the serial. The howling wind of the high Alps, the empty hallways of the school, the sound of objects being thrown about…but the standout is the piano tune, a low piece that is evident in the background though most of the first episodes, whose beauty quickly become much more sinister. There’s a certain “action sequence” in the third episode that comes off as something you’d expect to see in a summer action movie, simply by the sound effects alone. Then, the serial hits the fourth episode. Cartmel tries to cram too much into the script. The explanation for the haunting could have served for the climax of the piece, with an internal fight against the poltergeist. But suddenly, the Doctor’s experiment that transported Nyssa comes back into play, as it turns out he was looking for something specific that gets dropped right into our laps in the fourth act. Much like the introduction to Chris Webber’s character, the lead-up to this new enemy, which solely consists of the Doctor mumbling cryptically about the original teleporter experiments, is inadequate to support the switch over from “ghost story” to the “main threat.” Even then, the main threat is defeated in a quick and easy manner. Some of the dialogue is clumsy too – overdescriptions of broken mirrors and flying objects when the simple sound effect and a few words could have served purpose enough. A tightening of the script and removal of the “real enemy” could have been to this serial’s benefit. 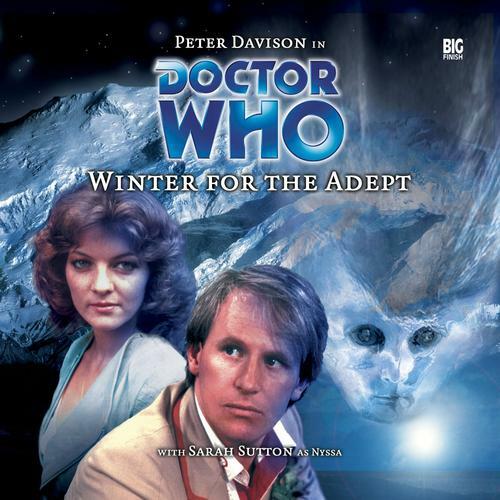 Final Synopsis – A well-written, well-produced, well-acted serial for three episodes until the writing fails during the final act, Winter for the Adept is worth listening to for the opportunity to hear what happens when a companion is fed up with the Doctor, as well as a chance see the Doctor being a dashing, adventuring researcher. 3/5. Sylvester McCoy is the Doctor in…The Fires of Vulcan.